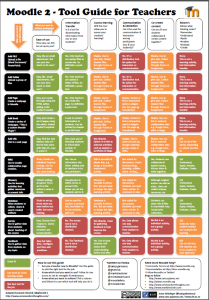 With so many resource types and activities in Moodle, I had put it onto two pages although am trying to work a version into one page, again this is something people will debate about! 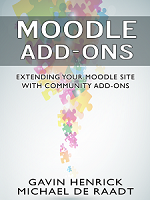 There is also now a German version and Spanish version of the Moodle 2 Tool Guide. Just one request, if you make a translated version, or a localised version, could you send a copy of the changed one to me for an archive. That would be great! All feedback & corrections welcome. This entry was posted in Moodle and tagged activities, Moodle, Moodle 2, Resources, Tool guide, Tools. Bookmark the permalink. I would argue with red for quiz and information transfer. A quiz with good feedback and carefully graded questions can be a great way to impart knowledge by getting students to actively engage with what they are learning about. The only example I can think of is terribly geeky: http://www.blueshoes.org/en/developer/syntax_exam/. You really would not want to read a static HTML page that takes you through all those edge-cases, but as a quiz, it is a great way to learn. It can also be a good way to learn mathematics skills. Very good point, although it was red in the original one, I do agree with you, and especially in self paced courses it can be great for information transfer. How do you get that across in the small box however? 🙂 Any suggestion on wording? Just saw the download link. Feel free to delete my earlier comment! You did a really nice job on this! Any chance I can get the editable PowerPoint file to make changes, such as deleting the resources/activities we don’t yet enable? After a bit more feedback in coming two weeks, will then be releasing the updated version and powerpoint. It will be after the Ireland Moot (april 2-4) where I hope to get more feedback. If you can wait till then, that would be great. Nice work, this new moodle2 version is very usefull. I’d like o transalte this to german, but I need the original in OpenDocument Format. Tried the pptx, but I loose to much layout. Could you try and save it as MSOffice97 ppt, so I can see if this will do? Would be great, thanks! I believe a German one is being done this week, but I will do a .ppt version too. Hi Ghenrik, great to hear about a german version. If the author(s) is(are) reading this: I’d like to help with translation. And a ppt would be great, too. Thanks! I’m making a Simplified Chinese version and have three questions about Information Transfer column. 1. Chat says “…Risk of non-interaction.” I can’t understand what is the risk. Does it mean users keep silent in a chat session? 2. Forum says “…High message volume?…” Why this is a question mark? 3. Forum says “…Risk of losing info.” Does it means forums are usually reset between teaching cycles?